Porous heel grips for shoes cushion tender heels and fill in loose-fitting gaps. Nonslip design customizes to shoe heel shape for a secure fit. 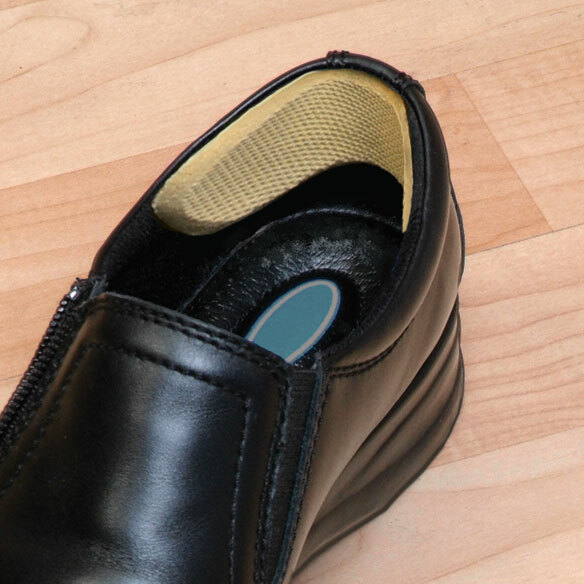 You don't have to wait to break in new shoes for walking comfort with these shoe heel grips! One size fits most. 2 pair. Made of polyester and foam; USA. I am a first time user for these heel liners but they do help to keep my heel from coming out of my shoe. I couldn't find them anywhere else.Also did not know what the name of them was. shoe size slightly off. keep on. Have a pair of shoes I love but slip at the wheel and hope these help. I was unsuccessful trying to locate these anywhere in my little town....but here they are---at my fingertips....and at a great price! Have a pair of shoes that "flop" when I walk; they're favorites of mine, so I want them to fit snug again. I have a narrow heel and shoes slip up and down when I walk. I am hoping this will help that situation. The heel grips I have purchased in stores just do not do the trick. If I can get the shoes to fit the rest of my feet, I walk out of the heels. Hopefully these will work in my dress shoes and I won't flop out of my heels. It looks like it would work to correct my problem of shoe width and heel width not accommodating my smaller heel width. I will know after I try them. I lost weight even in my feet so my shoes have gotten too big for me. I have a wide foot with narrow heels. I have a pair of dress shoes that need to stay on my foot. Shoes are not made like they use to with heel sizes aaa thru eee; and regular width with various combinations and the heels on most shoes slip off my feet even though the toe room is perfect. One foot especially has a problem with heel coming up out of shoe when I walk. I have a pair of shoes that slips off my feet. Because my new shoes gap on the sides and I want to keep and wear them....Sketchers! I bought a pair of shoes that are too large. The smaller size was too tight. I need something to keep the shoes on my feet. I need these to keep my shoes in place when I walk. To keep my heels from slipping off the back of my feet. I needed an aid in making my shoes a little tighter in the heel. Because this is the VERY FIRST one (in years) I've found that actually helps you hold the shoe on your foot. If it really does work, I'll order some for all of my dress shoes. I chose this product because my left and right heel are not well supported in my tennis shoes. I believe that I am experiencing heel issues due to loose-fitting gaps. I hope that this adjustable ankle support is the solution to my problem. to try out non slipping of shoes. I never tried this before and my favorite shoes slip off the back of my heel. Needed for heel that was loose. Athletic shoes slip on my heel.